The deal is a nothing short of a coup for the Brewers, as they gained the rights to buy a year of Anderson’s free agency for significantly below market value, without committing to any extra money or years. In return Anderson gets to lock in his next two annual salaries. That is some well-deserved financial security for the man who, at least for the time being, looks to be the 2018 opening day starter. Anderson, like many of his teammates, had a breakout campaign in 2017. He posted a career-low 2.74 ERA. He struck out 23.4% of the batters he faced, a 5% increase over 2016. He walked fewer batters than his past two seasons, and saw a sharp decrease in the home runs he’s allowed. If he can keep up those numbers and stay healthy, the Brewers will have just inked one of the most valuable contracts in baseball. Is that feasible, though? The short answer is probably not. A sub-3.00 ERA is Cy Young-level results. I don’t think anyone thinks that Anderson suddenly became a perennial Cy Young candidate at 29 years old. That said, we shouldn’t be fooled into thinking that Anderson’s 2017 was a fluke. An ERA in the low-to-mid 3’s isn’t an unrealistic expectation. Since his rookie season, Anderson has added 2 full mph to his fastball. He’s developed the quality of, and his confidence in, both his cutter and his curveball. Each pitch saw a 5% increase in usage last season, with the cutter supplementing his 4-seamer and sinker, and the curveball giving him another off-speed option to mix with the change. The increased confidence in those pitches kept the hitters guessing, and kept them from sitting on the 4-seamer. That’s probably a big reason why he allowed so many fewer home runs, despite the record number of home runs across Major League Baseball. Anderson’s improvement is real, and the only thing I’d really be concerned about is his ability to stay on the field as he’s never thrown 155 innings in a season. The Brewers got a very good player to agree to sign to a very team friendly contract. I’m happy for Anderson, but a little puzzled as to why his agent couldn’t get a better deal for his client. At the very least, they should have locked in his 3rd year of arbitration, or made the value of his 4th year option closer to what he could be looking at in the open market. He was in line to hit free agency before his age-33 season. Now he’ll either hit free agency for his age-34 season, or as damaged goods, having just been bought out. Signing this extension lowers his potential future earnings significantly. Anderson’s extension is the first of what could be many extensions handed out by Milwaukee this winter. Travis Shaw, Domingo Santana, Corey Knebel, and even Orlando Arcia could be signing long term agreements with the club. Anderson is also the first of several pitching additions the Brewers could be making this offseason. With Jimmy Nelson set to miss most, if not all, of the 2018 season, the Brewers will probably be making some splashes in the free agency and trade markets to bolster their rotation and bullpen. This was an offseason starting point that Brewers fans should be very pleased with. If this looks like fun, and you’d like to give DFS a try, click here and tell them I sent you. My lineup did well two weeks ago, and finished middle of the pack last week (thanks for nothing Aaron Nola). Currently I’m sitting and I’ve moved up to 16th in the overall DFAC rankings. Will you look at that. You can see my lineup for this week above. I’m imagining Felix and Scherzer will be highly owned tonight, but I hated their price (and Scherzer’s matchup) with so many big name bats in good situations tonight. unfortunately, even by saving money with Tanaka, I still couldn’t get most of the bats I coveted (Ortiz (not even starting anymore), Posey, Goldschmidt, Arenado, Desmond… Oh well. My team ain’t bad today. I’m loving Beltre despite the wind, and Chris Carter against a struggling John Lamb, even if the roof is closed. Mostly, though, I like Crawford and Tomas and Calhoun’s matchups. On second thought, I’m not very confident in tonight’s lineup. Wins are incredibly important for pitchers, and since he’s facing Chris Archer, Tanaka is far from a lock to win tonight. 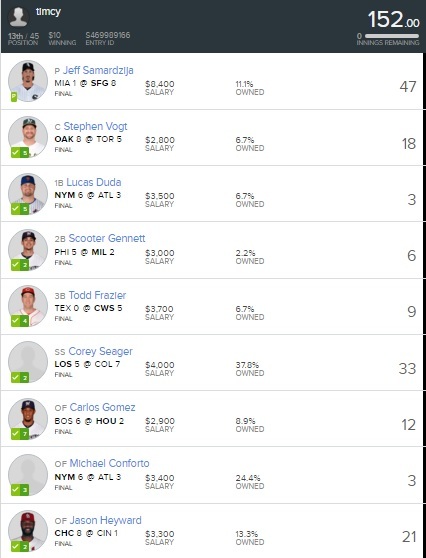 Beyond that, I had to bargain shop enough as it is, that I might as well have gone all out with Felix and filled out the rest of my lineup with quad-A guys facing quad-A pitchers. Whatever, good luck tonight, hope you fare better than I do. My lineup did well last week, led by Jeff Samardzija, Corey Seager, and Jason Heyward. I finished 13th on the week, and I’ve moved up to 20th in the overall DFAC rankings. You can see my lineup above. There are a lot of upper-tier pitchers starting tonight. Strasburg, Kluber, Felix, Tanaka, Smyly, and Matz are all taking the hill. Outside of Kluber, though, I didn’t like any of their matchups that much, at least not at that price. Instead, I went a cheaper route, and took Aaron Sanchez. He’s going against Smyly, so a win isn’t a sure bet, but Tampa Bay’s offense is miserable. They’re in the bottom 5 of both strikeouts per game and runs per game. Sanchez was roughed up at home last time out, but this time he’ll pitch in one of the most run-suppressing ballparks in the league. Beyond Sanchez, I wanted to get some shares of righties against Adam Morgan in Philly. Yan Gomes has not hit well this season, and his price reflects that a bit, but that’s almost entirely because of his performance against RHP. Against lefties, he has a .308 AVG and .231 ISO. Sure, it’s a small sample, but his career wOBA against lefties is .340, so this isn’t a fluke. Gomes isn’t the only Indian I took, though. I’ll also be playing Francisco Lindor, and his career .914 OPS against lefties. Last week I predicted that Bud Norris would get punished by left-handed Mets’ bats. I was right, except that all the damage came from Curtis Granderson, while I rostered Lucas Duda and Michael Conforto. This week, the Mets take on Jake Peavy. Peavy has been hit significantly harder by lefties than righties throughout his career, and this year he looks as washed up as ever. The Rockies aren’t at home, but playing in hitter-friendly Arizona shouldn’t stop you from picking on Tyler Chatwood. Lamb only gets to play so often as a platoon player, but in 87 plate appearances, he sports a .297 AVG and a wonderful .257 ISO. I filled in the rest of my outfield with a pricey, stat-collecting juggernaut named Ryan Braun, and an underpriced Gregory Polanco in the midst of a breakout campaign. Braun’s hitting .352 with 5 HR and a .268 ISO. Polanco’s reverse splits actually make him a bit of a risk, but it’s tough to find more talent at that price. To round out my lineup I grabbed Chase Utley. Chase is cheap, and always good for a few points. I would have preferred to spend less here, but I didn’t like many of the options. I’ll surely grab some shares of Kluber in other lineups, but I like Sanchez tonight. It’s a calculated risk taking Sanchez instead of Kluber, so hopefully it pays off. Good Luck, and hopefully this will help your lineup pay off for you as well. After another week of the DFAC, the ship appears to be back on course. My Samardzija pick paid off, as the Giant destroyed the Marlins. The late night win (12 pts) catapulted me into the money. I ended up finishing 13th. It’s my second week finishing in the top third of the field. If this looks like fun, and you’d like to give DFS a try, click here and tell ’em I sent you. Anyway, congrats to Dave Potts for somehow finishing 1st this week, despite not having Granderson in his lineup. Nice work. Thanks to Fantasy Pros and Fan Duel, I am once again competing in the Daily Fantasy Accuracy Cup in 2016. Each week, myself and 44 other daily fantasy writers compete in a Fan Duel contest for actual cash money. Our scores are totaled, along the way, and by the All-Star Break we’ll have decided which writer gives the most accurate advice. 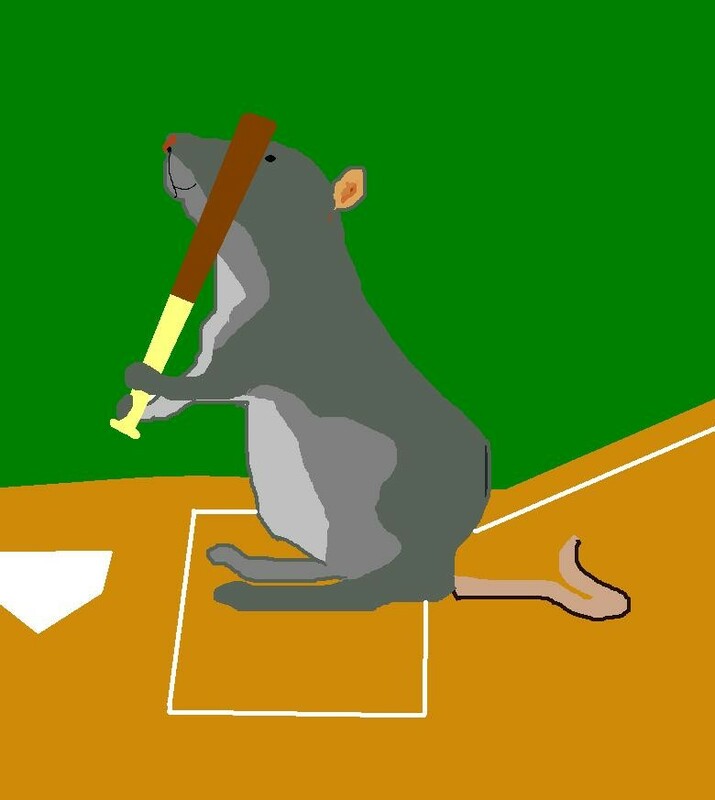 Each week, I am posting my lineups here on Brewer Rat, along with some analysis. Last week was much better than the week before. I finished 15th, the exact bottom of the top third. Carlos Martinez got me a nice bounty of 42 pts for $9,000, and I got 3 HR from Vogt, Pujols, and Gardner. Unfortunately, Trout left me hanging, only scoring 3 points off of Tommy Milone, but I’m happy with a 15th place finish. I’ll be honest, I threw my lineup together rather hastily this week. That doesn’t mean I don’t like it, but it also doesn’t mean I’ll be entering it in a lot of games tonight, outside of the DFAC. It also means that I’ll rather hastily be putting together my lineup analysis. There’s a lot of high quality, high priced pitching starting tonight. Lester is very tempting against the Reds, but at $10,600, I couldn’t pull the trigger in that ballpark. Harvey would make a nice contrarian play, Gio and Wainwright have nice matchups, Corbin, Moore, and Quintana would all make solid plays, but I really like Samardzija’s chances at the W, as he faces off against Cosart. Aaron Sanchez looks great so far, but Vogt’s tough to pass on at $2,800 against a RHP in Toronto. Sure, the game is in home run suppressing Atlanta, but Duda crushes RHP (career .226 ISO vs RHP), and Bud Norris is pitching. Many of the struggles that Nola has had have come against left handed hitters. Scooter is never an ideal play because he weighs about 75 lbs, but he’s been fantastic so far this year, so I’ll try to ride that out. This pick is more about Perez than it is about Frazier. Perez is always a threat to crap the bed. Frazier is one of two home run threats the Sox have, so he’s in my lineup today. Wright is the type of pitcher that Gomez could completely flop against. Gomez thrives off of fastballs, and Wright isn’t gonna bring the speed. However, if he hangs one, Gomez is taking it deep. I think this is a pretty big all-or-nothing play, but it’s a risk worth taking for less than $3,000. Conforto’s price is starting to rise, but $3,400 is still to low, especially when he gets to face a RHP like Norris. More than 75% of Heyward’s home runs have come against righties. 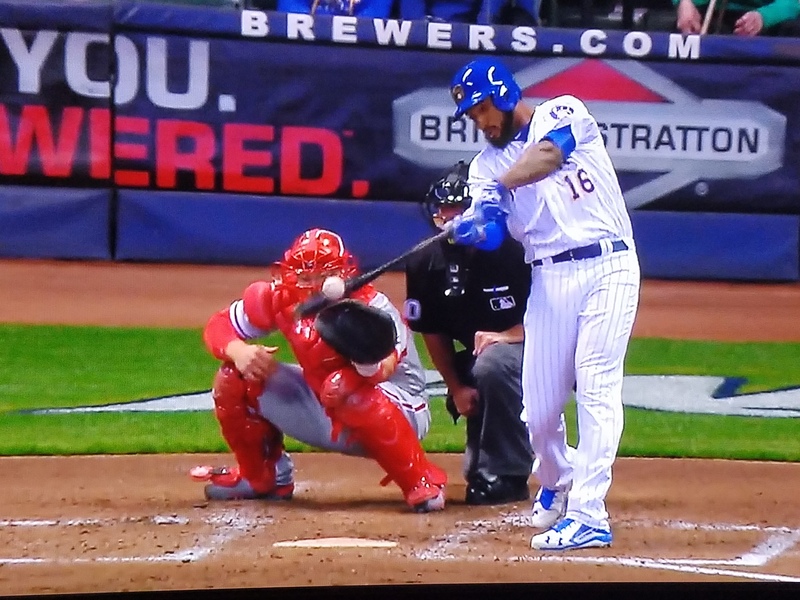 He’s not much of a power hitter, but against a pitcher like Moscot that doesn’t induce a ton of groundouts, and in a tiny little stadium like GABP, I’m digging Heyward. Once again, I’m taking a pitcher that is facing the Reds and their weird mix of aging veterans and beginning-of-rebuild talent. This time, my pitcher will get to face them outside of Cincy. Lots of great pitching is going tonight, but Martinez should be able to compete with the the best, considering his matchup and ballpark. Vogt is always a nice cheap play, given his aptitude against right handed pitching. He’s not the best option, but at his price point, he’s head and shoulders above the competition. Given how much great, expensive pitching is going, Vogt should be highly owned tonight. The name of the game is home runs with Pujols tonight. He’ll face a bad left-handed pitcher in Tommy Milone at Target Field. $3,000 is hard to go wrong with here. Williams Perez would not be in the starting rotation on many major league teams, but here he is, starting tonight against the Marlins. I like Gordon’s chances of reaching base tonight, and the Braves have been allowing stolen bases like wild. Opposing teams are 8/9 swiping bases against the Braves. While most of that is an indictment of A.J. Pierzynski, Tyler Flowers hasn’t thrown a runner out yet, either. I’ll be honest, until the Yankees lineup came out, I had Alex Rodriguez slotted in here. As it turns out, ARod isn’t starting tonight, so I took another underpriced home run threat, in Seager. I’m not huge on his matchup against Severino, but as a low-cost lefty in Yankee Stadium, I doubt I’m the only one playing Seager tonight. Porcello has had quite a rocky past year or so, and this Blue Jays lineup has the ability to really rattle a pitcher. Tulo launched a line-drive home run last night. He’s heating up, and could knock a couple off of the monster, and hopefully drive a few runs in, and he comes in at just $3,000. This one’s pretty simple: Talented lefty vs. RHP in Yankee Stadium. I like Karns, but not tonight. I’m always amazed when I see Vance Worley’s name on the schedule. He hasn’t done much to prove that he’s a viable Major League starter, so I had to take someone on the Rangers. Tonight’s choice is the red hot Mazara at $2,700. Milone’s given up 65 career home runs to RHB, so I chose the Angels two most powerful RHBs. Trout’s $4,900 price tag is hopefully enough to scare other folks off (especially those that chose Kershaw), so I’m really hoping for a big game. Between Trout and Martinez, the rest of my roster had to be constructed on a budget, but I’m happy with it. Good Luck tonight!